You may have heard that Internet.org is a nonprofit organization launched by Facebook CEO Mark Zuckerberg and dedicated to bringing Internet access to people who can't access it, or can't afford it. But this isn't true -- not any of it. The realities of Internet.org came into question last week when India banned it from the country. If the Internet is good, and Internet.org simply exists to get people on it, why was it banned? Let's start with a basic question. Internet.org is not a nonprofit company or even an organization. Internet.org is a business development group within Facebook aimed at increasing Facebook's users and revenue. The group is headed by Chris Daniels, whose entire career at Facebook and Microsoft before then has been in business development. His title on LinkedIn is: "Vice President, Product - Internet.org at Facebook." What is business development? I think the best definition comes from James Cohane. He defines business development as: "the function at the company responsible for identifying, securing, and/or managing relationships with organizations outside of the company (excluding customers and suppliers) that helps other key functions at the company achieve their respective goals." And that's what Internet.org is. Its function is to work with other companies, carriers and governments to help Facebook as a company achieve its goal to increase the number of Facebook users. Ultimately, for both Facebook and its partners, Internet.org is nothing more than a customer-acquisition initiative. OK, so what? At least Facebook is bringing the Internet to more people, right? Facebook's Internet.org division is doing many things to connect poor people to online resources, from drones to free access. For now, the main way is through a site and app called Facebook Free Basics (which used to be also called Internet.org, confusingly). You can access Free Basics only with permission by your carrier. Free Basics is available on 38 countries, all of which are in Africa, Asia, the Middle East and Latin America. Internet.org and Free Basics operate in countries where data use is often charged by the megabyte or by the minute. So the idea of using the Internet for free can be an attractive idea to many of these users. Facebook chooses which sites are included and which are rejected, and the local carriers may get veto power as well. Facebook has published these criteria, which are focused on the size of the data load, and has thus far not rejected any sites for reasons that are not technical. Facebook claims that any site, including competitors, are allowed to join Facebook's Internet. For example, Facebook does not enforce the "community guidelines" required of companies setting up shop on Facebook.com. What's really surprising is that Facebook isn't even providing the subsidy -- the local carriers are, according to a report on Buzzfeed. That same report also pointed out that nearly all Free Basics users were already on the Internet before they started using Free Basics. They simply use it to reduce their data bills. Carriers participate because it's part of their customer acquisition strategy. It's a "free" thing they can offer customers. Instead of providing Internet access to people who didn't have it, Facebook's Internet.org is more frequently taking people who do have Internet access and taking them off it. Facebook says Internet.org's mission is to get people online for the first time. Under the Internet.org umbrella, there's no doubt that they're working toward that goal. In these early days, however, there's no evidence that most Free Basics users are new to the Internet. Once on the site or the app, users are shown a list of icons representing websites. By tapping on an app icon, users go to what looks like a stripped down version of the website. For example, a news site might show the news headlines for you to click on to read the story, but the pictures might be small thumbnail versions, and user comments may have been removed. If you want to look at a picture full size, it will send you over to the for-pay Internet where you can see the picture in all its glory, but pay the normal carrier data rate for it. Internet.org claims to provide access to the Internet for free. In fact, it's not the Internet that Internet.org offers. One difference is scale. There are a few dozen sites on Facebook Free Basics. For a while there were just 38, but they're continuing to grow it. These include Wikipedia, the Facts for Life health site run by the United Nations Children's Fund, BBC News, a weather site, and typically a few local resources for each market. And, of course, Facebook. Eventually, it might reach as many as 100 sites, so let's generously use 100 as the number of "sites" on the service. The most conservative number of websites on the web that I could find is 2 billion sites. So even if Free Basics "sites" were actual sites on the Internet (which they're not), it would be 0.00000005 percent of the web. The real Internet is at least 20 million times bigger than Facebook's fake Internet. It's like McDonald's giving a poor person a free sesame seed and claiming credit for giving them a free Big Mac. The other important difference for Facebook is that Free Basics offers a version of the "web" without any of Facebook's competitors. Facebook is open to competitors, and has invited everyone to participate in Internet.org. But none have decided to embrace it so far. Internet.org offers an "Internet" without Google Search or any other Google service, for example. It also lacks the most valuable resources. Facebook Free Basics has no government sites, no educational institutions, no entertainment. It's a brilliant scheme for Facebook, if you want to take the cynical view. It gets the customers, the user data and the ability to monetize with advertising, while keeping people off the Internet and away from rival companies and other services that might distract people from spending most of their time on Facebook. 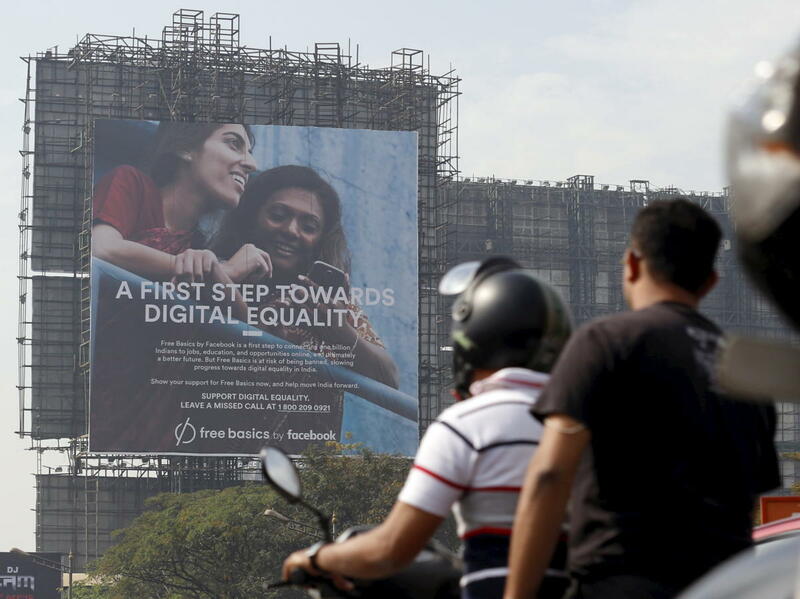 The legality of Facebook Free Basics has been hotly debated in India for the past few months, as India's telecom regulator considered the matter. During that time, Facebook used the social network to spearhead an astro-turf campaign. It offered users there the option to have their voice heard on the issue, along with peer pressure: It informed users which of their friends had "voiced their opinion about Free Basics." When users clicked, they were greeted with a note written by Facebook in support of Free Basics that could be sent to the regulator with the click of the mouse. The campaign didn't work. India banned it. The reason is net neutrality. Indian regulators determined that Internet.org and Free Basics created a two-tier system, where startups buying into Facebook's fake Internet were giving privileged access to users, and those not buying into it were disadvantaged. Internet.org and Free Basics is really nothing more than something called a "zero-rating" content scheme, where some content is provided outside the normal data plan -- something widely viewed as anticompetitive and a violation of net neutrality. Let's say, for example, that a user reads a certain news site on a phone. The user might later sign up for Free Basics, and to save money, starts getting news on the BBC News site instead. That's the kind of choice net neutrality laws are designed to prevent. The bigger picture, though, is that many other companies, organizations and governments are working to bring down the cost of Internet access, and also to spread the reach of the Internet. Facebook's Internet.org and Free Basics interferes and competes with those initiatives by incentivising users to use Facebook's fake, walled garden Internet. Today, Internet.org is a customer acquisition strategy that mainly takes people off the real Internet some of the time and puts them on a fake, Facebook-controlled alternative. Facebook has long been accused of creating a walled garden social network, and also of duplicating the Internet on Facebook itself. Internet.org is the ultimate expression of that strategy. Facebook found a way for people to use Facebook without using the Internet, while simultaneously getting credit for providing a massive good for humanity. But as an informed technologist, you should know: Internet.org is neither the Internet nor an organization. Free Basics is not free and does not provide the basics that people can access on the real Internet. Internet.org is just Facebook being Facebook, doing everything it can to get as many users as possible.